LONDON (Reuters) – Vodafone UK said on Saturday hackers had accessed the accounts of 1,827 of its customers this week, the second cyber attack on a British telecoms company this month. The attackers had potentially gained access to the victims’ bank sort codes and the last four numbers of their bank accounts, along with their names and mobile telephone numbers, a Vodafone spokesman said. “This incident was driven by criminals using email addresses and passwords acquired from an unknown source external to Vodafone,” he added in a statement. 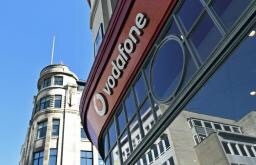 Only a handful of those affected in the Thursday morning attack had seen any attempts to use their data for fraudulent activity on their Vodafone accounts. “No credit or debit card numbers or details were obtained. However, this information does leave these 1,827 customers open to fraud and might also leave them open to phishing attempts,” the spokesman said. The company was contacting all those involved and that other customers need not be concerned, he said. Posted on October 31, 2015, in #retail, #uk, How not to do retail ...., Other. Bookmark the permalink. Leave a comment.